Please find attached our ‘entry form’ for the races in light that some of you members may be interested in taking part in this new event, which will be held on Saturday 12th July, one week before the Snowdon International Race as you well know. The 5k course in relatively flat for the leisurely runner, whereas the 10k is quite a bit more testing with some inclines, which should interest the keen runner, as well as others who keep fit. Hope you can pass the message and details onto your members and any others, and hope we may see some Eryri runners at our event on the day. There was success for Eryri’s Jackie Lee at the penultimate race of the British Mountain Running Championship held in Scotland last weekend. A fine 2nd place behind British International Victoria Wilkinson ensured that with only the last race to be held in Llanberis in August, Jackie will take the title for the first time and only the 2nd lady from Eryri to do so behind Angela Carson/ Brand Barker in the 80’s. With support from Serena Wagg and Kate Worthington the ladies took 3rd team on the day and go into the last race in 2nd place on home turf. Click here for race event page and entry form for this new race created for the British Champs counter hosted by Eryri Harriers. 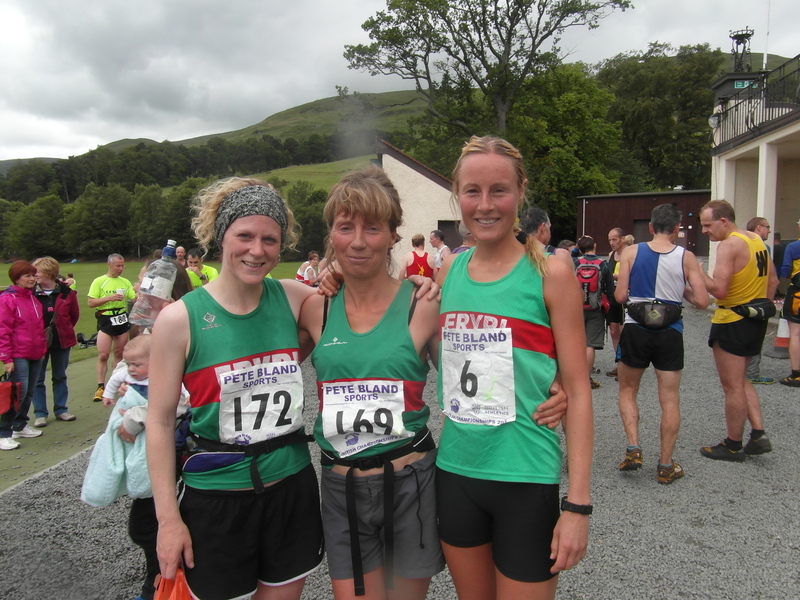 Alun Vaughan, Andrea Rowlands and Rob Samuel were the Eryri Triple winners at Coed Y Brenin on Saturday 21st June in what were dry and very warm conditions for the Trail Marathon Wales event. Rob Samuel was the first success of the day in winning the Half Marathon in a time of 1:23:03 ahead of Aberystwyth’s Felipe Jones 1:25:32 with Aberystwyth University Harrier Gary Davies 3rd; 1:33:00. Dewi Owen had a very good run to finish 5th; 1:35:03 ahead of club colleague Dylan Jones; 1:37:48 with Arwel Lewis taking the MV/50 title in a time of 1:43:22. Then it was Alun’s turn to cross the finishing line, winning the full Marathon in a very good time of 2:53:15, his Half Marathon time of 1:27:41 would have placed him 3rd in that event! Last years Marathon winner Andrew Siggers (Kenilworth Runners) placed 2nd this time round in a time of 3:01:26 ahead of Eryri’s Richard Roberts 3:04:26. Andrea Rowlands made it a treble for Eryri, finishing 11th overall in the Marathon with a time of 3:30:06, over 17 minutes clear of the 2nd placed female finisher Mary Spalton 3:47:29. There were 389 finishers in the Half Marathon and 309 in the Full Marathon in what was a very well organised event run in excellent conditions. Well Done to Matt ward and his fantastic team. If you fancy racing with loads of holiday home owning runners from Cheshire and taking part in yet another commercial enterprise there’s the Abersoch Half in October. But don’t worry, 50p per entry is going to charity. Our first Abersoch Sprint Triathlon was a great success last Saturday. I have copied you in on our race report. Some of your members entered the event and I thought they may be interested in the report. There was a hugely successful second running of the Pedol Cwm Pennant on Saturday. Nearly double the number that turned up in 2013 started the race – 80 runners in total. Once again Macclesfield’s Simon Harding took the win in 2.40.41 – on a slightly shorter route, Simon still broke his race record of last year and led from start to finish. Dark Peak’s John Hunt finished strongly to end in 2nd and 1st vet 40 with the ever improving NWRR Mark Davies taking 3rd in 2.50. 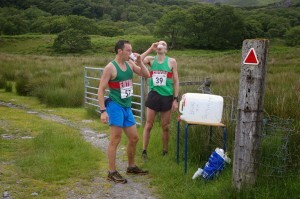 4th and 5th went to Eryri’s Matt Fortes and Martin Cliffe with Cliffe taking 2nd vet 40. 1st male vet 50 was Noel Craine, finishing in 6th overall and 2.54 – 15 minutes quicker than last year. Andrea Rowlands broke the ladies record by winning and finishing in 15th overall in a time of 3.03 – Andrea was also 1st lady vet 40. 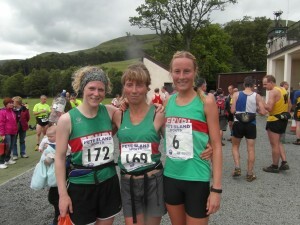 Mel Price of Mercia and Caitlin Rice of Glossop took 2nd and 3rd lady. 1st male vet 60 was again Bowlands Alan Duncan finishing in 48th overall and 3.43 with Emma Collins of Denbigh and Maggie Oliver of Eryri taking the ladies vet 50’s and 60’s respectively. In the team competition, Eryri mens took the win ahead of a joyous Glossopdale who wipped Dark Peak into 3rd, with Eryri ladies taking their title. So once again a cracking running on an excellent route and let’s hope the race gets bigger and better. Once again a big thanks to the army of efficient helpers – Chas and Jenny Muskett, Dils Rowlands, John Rowley, Iorwerth Roberts, Pete Rowley, Paul Hodges and friend!, Rory O’Donnell, Sioned Rowlands, Tina McDonnell, Arthur Connell, Becki Law, Edwin Roberts, Sandra Rowlands, DWT Snr, Trefor Jones, Lorraine Roberts and Sherie, Janine and family and Lisa and family. Thanks also to Ken Crossley at the Cwm Pennant hostel, Alun Rhwngddwyfon and all the Cwm’s landowners. Richard, Emyr and Ieuan at Bryncir farm. Peredur from Cwrw Llŷn and DMM. “It is midnight as I am writing my report and the midge bites are only just going down. Well done to John Parkinson, overall winner and 19 secs off the previous vet 40 record set 4 years ago. Meanwhile Becki Law tightens her grip on the ladies title with another win.